Les Salaisons du Mâconnais, directed by the Fouilloux Family since 1919, is located in the centre of the village of Pierreclos, in the Saône-et-Loire department. 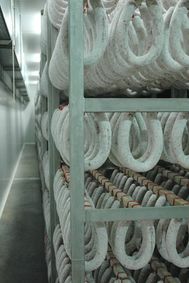 Specialising in dry sausages, the company produces 4,500 tons annually primarily for supermarkets and superstores (+80%), in particular under distributor brands. The IFS* Certified plant, which employs 120 people and occupies an area of 16,000 m2 was recently expanded by 1,500 m2, in which an 8,200 m3 low temperature (LT) cold room was installed. 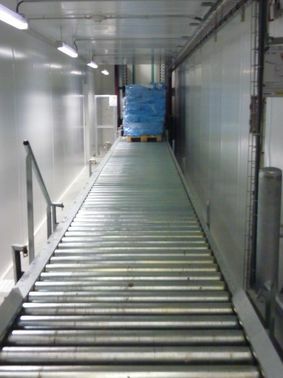 Commissioned in March 2013, "it allows for the storage of all frozen raw materials (pork meat and fat) required for sausage production at -22 °C, up to 2,500 pallets, each loaded with approximately 400 kg of meat", explained Franck Marchand, Industrial Manager. In the past, these ingredients were stored outside the plant, several kilometres away. Bringing them back to the production site eliminates costs incurred for external storage and transport. 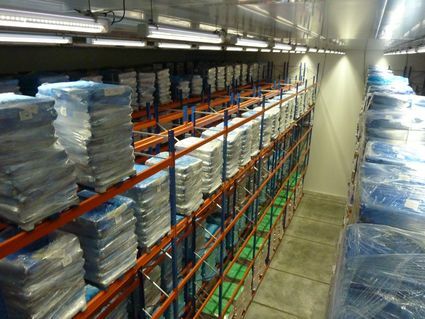 The high storage volume is also needed due to the requirement to keep raw materials for which prices can fluctuate significantly. While the old cold room was kept to hold buffer stock, it is now linked to the new one by a tunnel also kept at negative temperature. The tunnel was dug under a road. 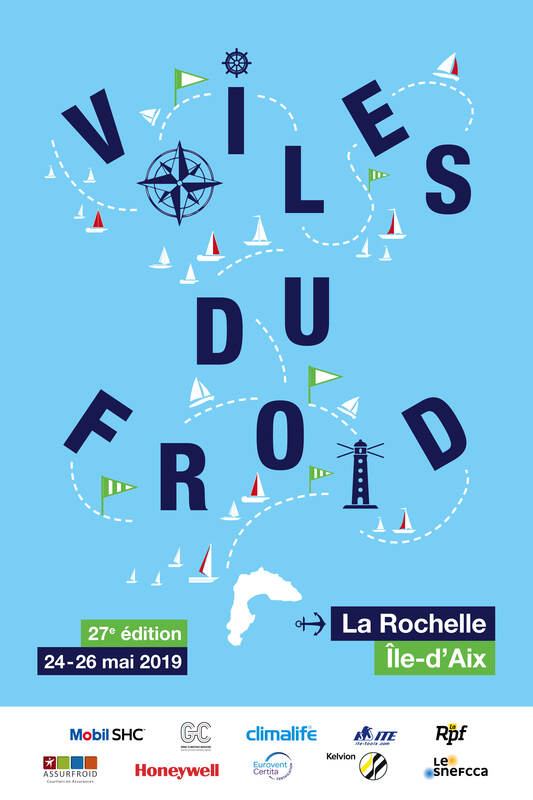 To develop the new LT cold room, Les Salai­sons du Mâconnais called upon Safriclim with whom the organisation had worked in a trusted relationship since its incorporation in 1996. Located in Charnay-lès-Mâcon, the company is jointly directed by Jean-Luc Hervé, Eric Lay, and Jean-Charles Barlet. Heavily involved in the early stages of the project, Safriclim proposed various options to account for a budget that was already strongly affected by the complex construction of the building (earth works, tun­nel, etc.). The other imperative was a low sound level due to the location of the plant within the village, which also eliminated an ammonia solution. Three variants were studied, explained Jean- Louis Hervé, for which the customer also wanted sectionalised equipment. The one com­bining CO2 and glycol was quickly eliminated for budgetary reasons, as was the direct expansion system with three units, including one emergency unit to provide spare capacity. 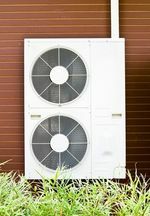 In the end, the solution adopted consisted of two identical devices sized to produce up to 125% of the power required, but still independ­ent to make it possible to provide at least 50% of cooling production in the event one unit failed. Originally designed to use R-404A, the facility was revised to allow for regulatory changes concerning refrigerants to select those with a lower GWP. Hence the choice of Performax® LT (R-407F with a GWP = 1824) distributed by Climalife for one of the compressors while the other uses R-404A. This configuration allowed the instal­lation engineer to test the performance of both fluids under identical conditions. The assembly built by R System has a rated cooling capacity of 78 kW at -32 / + 45 °C. It incorporates sub-cooling of the liquid to 15 °C through the above-zero rack that cools the loading dock. 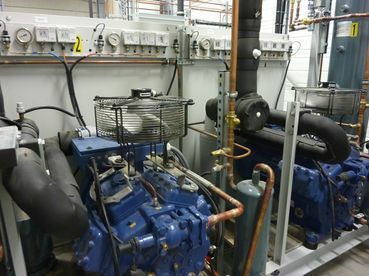 The decision was made to use two Bock semi-hermetic compressors, on the advice of Franck Sgaramella. The manufacturer commit­ted to R-407F, which at the time the decision was made was not yet in use by all compressor man­ufacturers, remembers Jean-Luc Hervé. He added, "Although this fluid certainly has a higher discharge temperature (on the order of 20%) than R-404A and a greater glide, but this is managed very well, and for safety reasons, head fans were added." 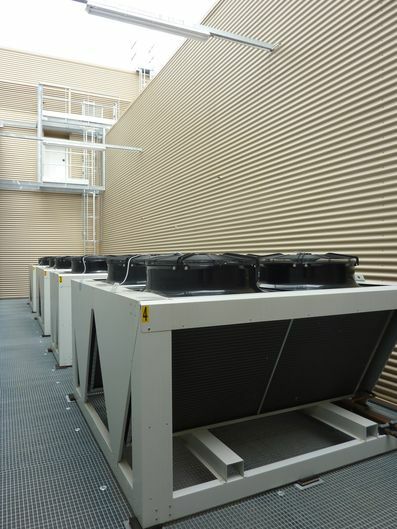 The facility has an Artika regulation system and GTC developed by R System, which also pro­duced the V condensers. They were placed on a gangway 10 m above the ground and were designed with a sound level sensitive to their location in the centre of the village, working silently at night. Since the commissioning of the room in March, and its loading in May, Safriclim, in conjunction with Climalife and Honeywell, instrumented the facility for three months, including the sum­mer, to compare its performance. 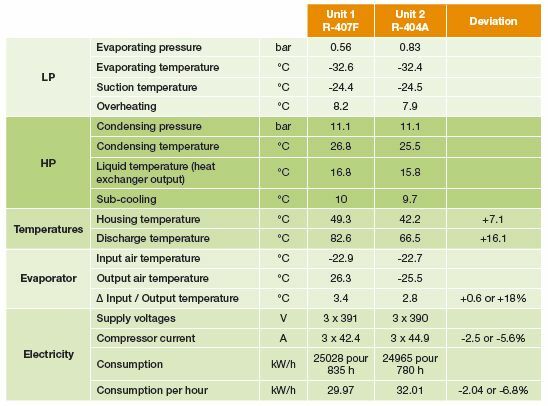 The compar­isons were highly favourable to the R-407F with a difference of -7% in power absorbed over 800 hours of operation (see comparison table). Heat is recovered from the unit to heat the packaging storage area. It should also be noted that as part of this plant expansion, Safriclim added cooling for the load­ing dock (+ 5° C) and a LT airlock (- 20° C) located just in front of the entry to the new cold room. The dock has a condensing unit shared with the under-coolers for the equipment used for the cold room. This unit includes two Bock HGX 4/555-4 semi-hermetic compressors using R-407F (95 kg) including one with a fre­quency converter. Its cooling capacity varies from 11 to 60 kW at - 8 / + 45 °C. To maintain - 20 °C, the LT airlock has its own cooling system with a Bock HAX 5/830-4 semi-hermetic compressor using R-407F (40 kg), with a cooling capacity of 11.6 kW at - 30 / + 45 °C. In light of the results observed at the facility, for Safriclim, there is no doubt that for an identical facility, it would now use only Perfor­max® LT. "This solution responds to changes in the F-Gas European regulation, which favours low GWP fluids", emphasises Pierre-Emmanuel Danet, Technical Support Manager at Climalife. This life-size study once again confirms the choice of R-407F as a replacement for R-404A and the real benefit in terms of energy efficiency. Low temperature cold rooms (- 22°C). Volume: 8,200 m3. Dim: L. 29.4 x l. 24.3 x H. 11.5 m.
Rated cooling capacity: 78 kW (2 x 39 kW) at -32 °C / +45°C. Refrigerant: 1 device using R-407F (130 kg) - 1 other using R-404A (130 kg). Lubricant: Mobil EAL Arctic 46. Compressors: Bock semi-hermetic HGX 8 2470 - 4 with 8 cylinders - winding cooled by the exhaust gases. Individual swept volume: 214.3 m3/h. Power consumption: 25.7 kW at -32 / + 45 °C. Head fan. Condensers: R System PV series - V Condensers with multiple coils on guide rails. 2-speed fans - 375 rpm with low sound level PV. Evaporators: Contardo - 2 evaporators with recirculating and shut-up sections. Electric de-frost (1 per 24 hrs.). Electric step-by-step regulators. Installed on a gangway.